Velarmino came into our lives and changed the trajectory of The Common Wheel’s programming focus. We had been concentrating on helping people, mainly youth, to improve their lives through the power of bikes. 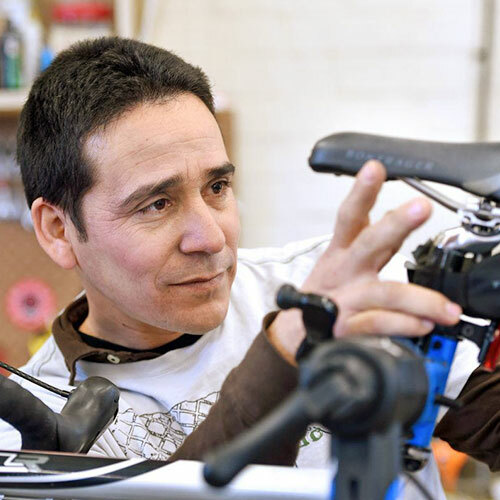 But meeting Velarmino gave us the inspiration to begin the Bikes for All to help adult refugees and low-income individuals who are re-entering the public sphere. Velarmino was pretty much “the man” in Cuba. Or, at least the man you went to to get your bicycle repaired. He had plenty of steady work in Cuba. Along with the plethora of 1950s cars, and there were more than enough bikes to go around. Working as a mechanic for 22 years, Velarmino kept bikes in working order so people could use them mainly for transportation. Velarmino made his way to the United States through a U.S. Citizenship and Immigration program. Church World Service was instrumental in helping Velarmino and his family make a new life here. His goal is to get a good education for his two daughters, and maybe even attend college himself, after his girls have the opportunity first. While Velarmino was waiting for his clearances to be able to work in the States, he volunteered at The Common Wheel. Volunteering at TCW was a way for him to be around something familiar, and to improve his English skills. Turns out we were the lucky ones, as Velarmino taught us more than we would know. Now, we are serving even more people through our Bikes for All program. Working with partner organizations such as CWS, Tabor Community Services, and the Transitional Living Center, we are able to provide a greatly reduced bike package to those who need it the most. Through a voucher system and a small cost to the client, we are able to provide a refurbished bike, a helmet, a lock, and a light set to clients to help them get to work, get groceries, and have a form of transportation that is efficient and affordable.